Robe, SA. A must on any Aussie bucket list. We left Adelaide this morning and are now on our way to Melbourne to catch the Ferry to Tassie. We’ve brought our sailing date forward to 20 January, so we have 13 days to enjoy the splendours of the Great Ocean Road. It’ll be a few days before we reach the Great Ocean Road, so we stopped in Robe, South Australia for our first couple of nights. I had barely heard of Robe, and Paul hadn’t heard of it all. We won’t forget it. The coastline is spectacular. The waves have a gentle roll, just enough to push a boogie board to shore – damn we gave our boards away. The beach is beautifully level for walking on and hard enough that even two wheel drive vehicles can drive along the shore in search of an idealic spot to spend the day. And a lot of people do just that. We went for a wander down the beach this afternoon after a refreshing swim, and there was at least a hundred cars parked on the sand. There’s two downsides to Robe though – the first is we only have time for a two night stay this times, but we will be back for sure. The second is the time of year we’re here. We managed to squeeze into the Discovery caravan park right across from the beach. Like all beach side places during school holidays, it’s jam packed with families. All having a great time, which is lovely to see, but for Grey Nomads who support these caravan parks all year, it’s tough to suddenly start paying top dollar and then to have our happy hour accompanied by at least a dozen kids racing up and down on scooters, playing frisbee or cricket, and whatever else kids like to to. Not to mention the parent who pushes their child that little bit too far past bedtime with the inevitable tantrum and/or screaming fit. There’s always at least one. Joy!!!! Now there’s an idea for booming business for someone. An over 45s caravan park – no kids allowed. No jumping pillows, no play grounds, no games rooms – just clean facilities, perhaps well kept gardens, and a reasonable all year round price that doesn’t go through the roof during school holidays. The insurance would be less, all the ground would be usable and I should imagine most (granted – not all) grey nomads require less cleaning up after. Perhaps, some budding entrepreneur will see a market for such a place. I’m sure it’d be well used, even more so if well behaved pets were also allowed. I’m sure the pets would be considerably less trouble than ankle biters of the human kind. 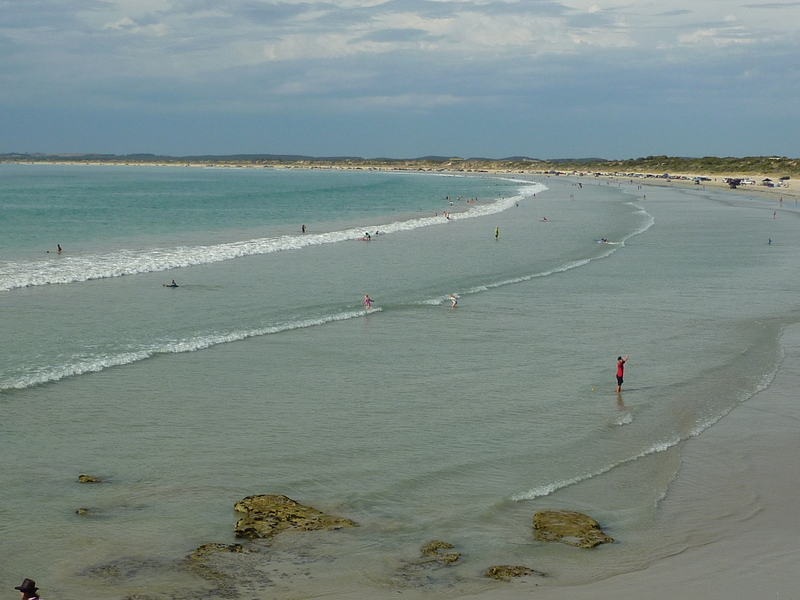 With or without an over 45s caravan park though, Robe is a place that’s worthy of being on anyone’s ‘bucket list’. Coming back here again is certainly on ours. I know. It’s been a good find. Our last night in Robe was nearly $50 a night and that was with a loyalty discount. Twice as much as we’re paying here with half as much immediate space and the only outlook was more caravans or cabins. Our outlook here is wide open spaces to the front and the back, and only neighbours to each side. All the vans are set up around a huge sports oval, and then look out to open spaces full of kangaroos. That’s the difference between a camp ground and a caravan park.